Sergio Dinale and Paola Rigonat Hugues have worked together since 1990. 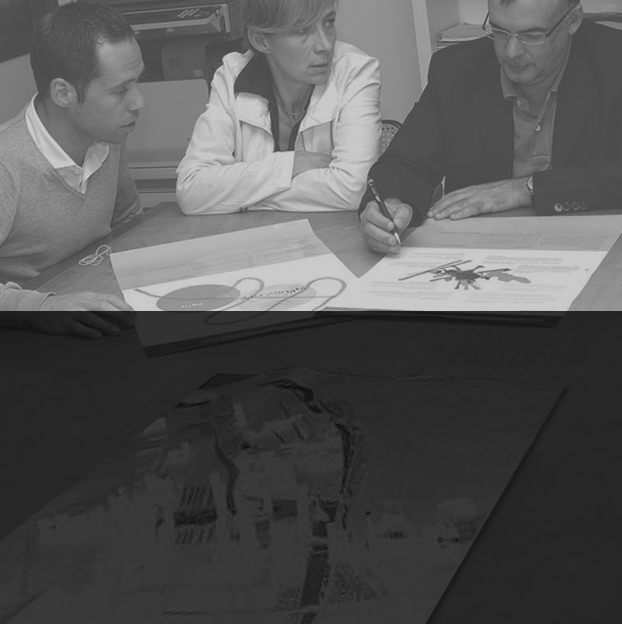 They have been partners and founders of the studio since 1996. Enrico Robazza and Alessia Semenzato were partners since 2009. Now the partners are Sergio Dinale, Paola Rigonat Hugues and Enrico Robazza. The close relationship between the projects and territorial themes such as the entirety of the architectural process and the general value of town planning combined with the exploration of individuality and the necessity for a collective living dimension. At the core of the design are the relationships between settlements and the surrounding environments and between public and private spaces. Increasingly a major issue within all projects is sustainability within contemporary cities. In consequence, at the centre of the projects is the human essence; fluxes of people, ideas and the cultures and innovations made by them. For these kind of projects, the Studio D:RH usually works in multidisciplinary team, including a biological naturalist, experienced in participative practices. In urban economy, research is undertaken by philosophers and a sociologist. After winning both the international competition for a new masterplan for Crotone, and the competition for the regeneration of the waterfront in Crotone, the studio has worked together with the Public Administration. This work includes the planning of a specific Plan of Public Spaces and of new building rules. The studio also took part in European projects in Crotone, such as Urban II and other Ministeral plans such as the Società di Trasformazione Urbana for the rail station and the city’s port. Many Public Administrations are clients of the studio, such as: Abano Terme (PD), Preganziol (TV), Pesaro, Morgano (TV), Narni (TR), Pesaro, Prato, Sarcedo (VI), Rosà (VI), Casalserugo (PD), Erba (CO), Vedelago (TV), Chiavenna (SO). The studio as also started many projects with private clients, as well as important residential, multifunctional and tourist settlements.